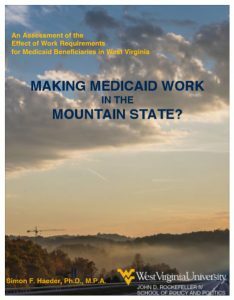 West Virginia University professor Simon F. Haeder provides an assessment of the impact work requirements would have on Medicaid beneficiaries in West Virginia in this new report. More than 200,000 West Virginians would be affected if West Virginia implemented work requirements similar to Kentucky’s. Of the 200,000 West Virginians impacted, 70,000 would be be exempt; 36,000 people are working and in compliance; 17,000 beneficiaries are working but do not meet compliance standards and 78,000 people are neither working or in compliance with the requirements, according to the report. The shift to work requirements wouldn’t come with just a human health toll, but a financial one, too. Read more about the full impact in Haeder’s report.